According to the October 2015 data from W3Techs, almost 55% of all the web content out there is still in English. Meanwhile, the latest report from Internet World Stats shows that non-English speakers now represent 74% of the world’s active Internet users – and that percentage is growing every year, as Internet penetration rates in non-English-speaking countries increase. Research conducted by the Common Sense Advisory has demonstrated over and over that an investment in languages contributes to a company’s growth and competitiveness. According to a new study, “63% of global brands recently reached more customers by increasing the number of languages on their websites”. It makes sense: the more languages you speak, the more people you can connect with. The more multilingual your website is, the more visitors you can attract, and the more customers you can gain. So why do 37% of global brands still have monolingual websites? Maybe because they built their online presence at a time when English was still the undisputed “language of the of Internet”. Maybe they view the translation of their web content as an unnecessary expense, not an investment in their future growth. Maybe they assume (wrongly) that most Internet users for whom English is a foreign language are happy to do business with an English-only website. Whatever their rationale, those brands are now falling behind. But translation is just for starters. The most successful brands go one step further: they invest in adapting their content for each regional market in ways that make it more culturally relatable. They ensure that their web content speaks directly to local cultural tastes and values. Certain regions of the world are more conservative than others. Some countries use higher levels of formality than others. Symbols and colours can also have very different connotations. And humour – though universally appealing – is also very culturally dependent, as this blog post from TranslateMedia explains. On top of that, there are practical issues: accommodating right-to-left text display for languages like Hebrew and Arabic, using local currencies and units of measurement, offering preferred methods of payment, following time and date standards, using local formats for mailing addresses and telephone numbers, etc. International e-commerce depends on all of these elements flowing smoothly. This whole process of adapting your web content for a particular region is called localization. 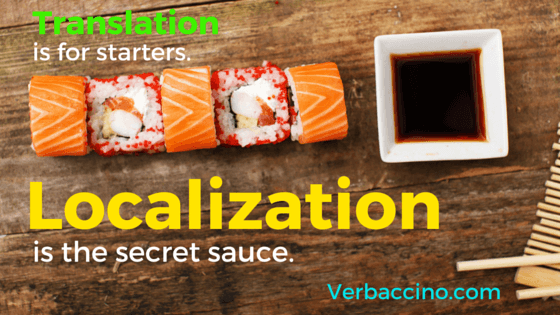 Think of localization as the secret sauce of your international marketing strategy. It’s that special combination of ingredients that gives your message a local flavour, appealing to the palate of a particular audience in a particular region. Without it, even professionally translated content can fall flat, cause unintended laughter, or leave a bad taste in your audience’s mouth. Here are some infamous examples, compiled for Campaign Asia-Pacific. Localization isn’t just important when it comes to translated content. It can be equally crucial when targeting different regional markets that share the same language. That’s because differences in dialect and culture can change your message in ways you didn’t expect. Every world language has dialectal variations. That includes English, and we’re not just talking about differences in spelling. For instance, check out Anglophenia‘s entertaining comparisons of word usage for common items of clothing and vegetables in British versus American English. In the same way, there are important differences between European and Latin-American Spanish – which, in turn, has many regional dialects. These 10 examples from the Freedman International blog give you a sense of how the meaning of words can vary significantly between regions. So how can you make sure that your content gets flavoured with the right secret sauce for your target audience? By working with language professionals who have a deep, first-hand knowledge of the local culture, and who keep up with current tastes and trends. Most often, that means hiring someone who is based in that region and who can evaluate the effectiveness of your message from a local’s point of view. That applies to international and global marketing as well. It’s not about you, it’s about your customers. Cater to their tastes and preferences. Don’t assume that what worked in your home market will work elsewhere. You might love hot salsa with your food, but others might prefer something less spicy. What’s appropriate in one culture can seem over-the-top in another. Do your research and get to know the market you’re thinking of entering. Beyond that, the challenge is in the execution. If you’re planning to expand into a foreign market, speaking the local language is no longer optional, it’s a necessity. But translation is just the beginning. You also have to show your target audience that you’re in tune with their culture, their values and their communication style. Adapting your content to suit the local palate helps build trust, creates good will and makes your brand more appetizing to potential new customers. 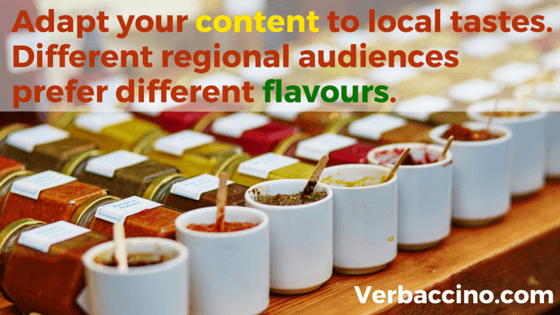 For any new market that you’re looking to connect with, there are localization experts out there who can help your brand develop just the right flavour – that (not-so-)secret sauce to keep your audience coming back for more. 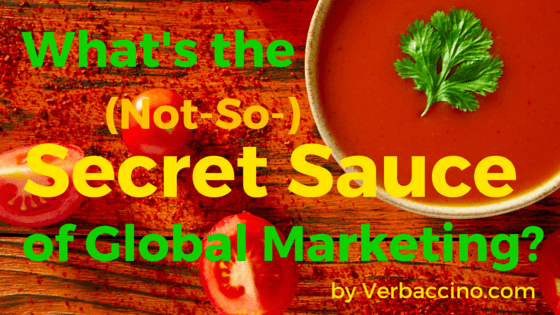 Pingback: What's the Not So Secret Sauce of Global Marketing?